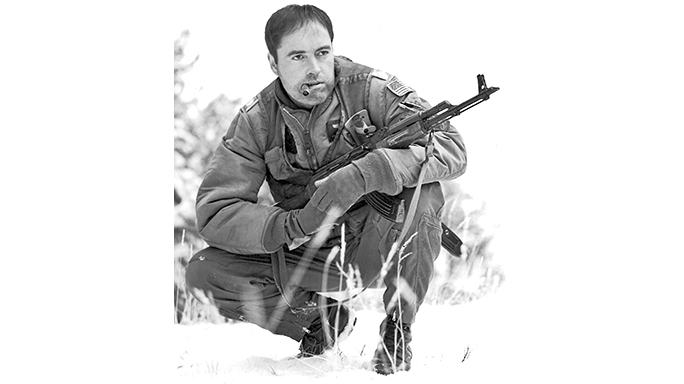 During the Cold War, Red Dawn left quite a mark on American viewers. In the film, many of the characters acquire Russian firearms in their quest to liberate the United States. 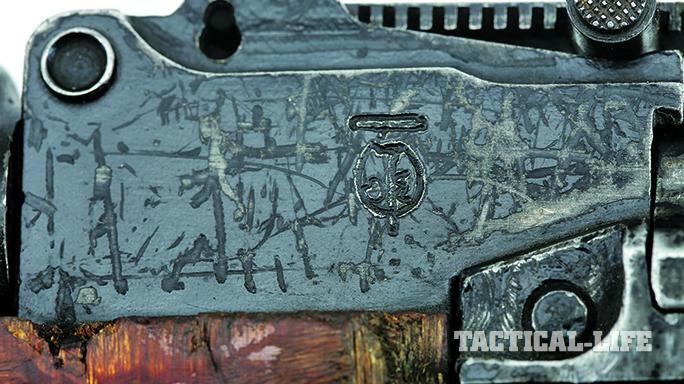 Before it was used on the set of Red Dawn, prop masters made the author’s semi-auto Steyr Maadi AKM, serial number S000350, look like it had been used and abused over years of service. 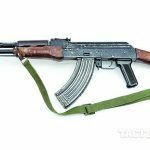 First imported into the U.S. in 1982, original semi-auto Steyr Maadi AKM rifles came with laminated wood furniture, three 30-round magazines and a sling. 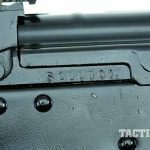 Though the exterior of the author’s Red Dawn prop rifle is sufficiently dinged and banged up, the interior is immaculate and it can readily fire live 7.62x39mm ammunition. Finding the first Steyr Maadi that came to the U.S. may have presented a slight challenge to National Firearms Museum Director Jim Supica, but, then again, he is more than a little used to this type of thing, as he collects serial “No. 1” firearms. Talk about an unusual collecting niche! 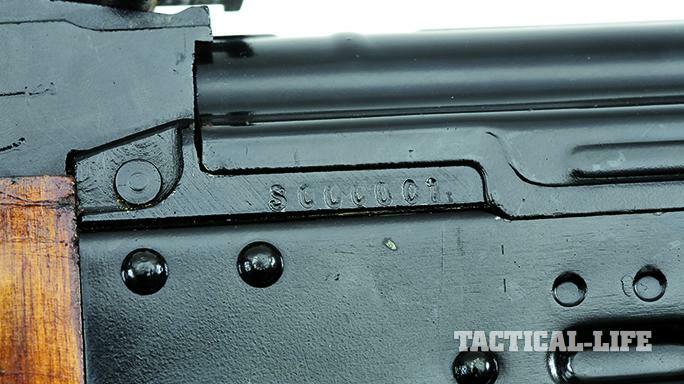 This mint-condition AK bears serial number S000001 and still retains its 30-round “Made in Egypt”-marked magazine. Maadi AKMs came with 30-round magazines marked with “Made in Egypt” near the feed lips to distinguish their country of origin. I can still recite those words, and the first time I read them was in early August of 1984—off at college and cycling between part-time jobs and full-time studies. Ronald Reagan was our president then, and like many single graduate students, I didn’t have a lot of spare change. But I went to see the movie “Red Dawn” on opening day, and it made a big impression on me. Enemy paratroopers falling from the sky, teenage boys and girls holding off Russian invaders, living off the land in the mountains of Colorado and, of course, the guns onscreen. 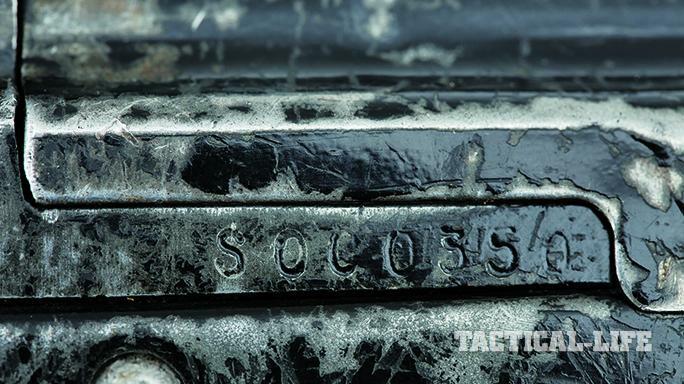 One of those guns sat next to me as I wrote this. I grew up with WWII television shows like Combat! always on the screen, and being part of a military family, I had spent five years out on bases on a small island in the Pacific—Okinawa. I was used to seeing M1 Garands and M1 Carbines and I owned examples of each. 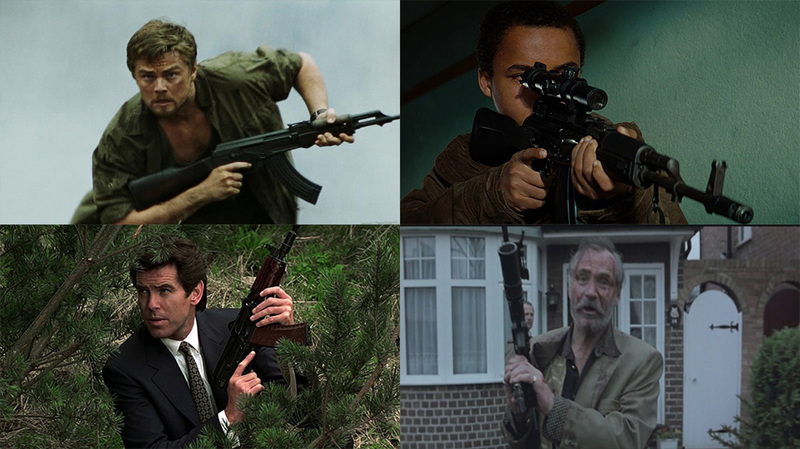 But to see actual AK-47 rifles in the hands of teenage actors on the silver screen was something I hadn’t expected. One of the stranger things about the film was that it was the first PG-13 film released in America. Looking back, the violence on the screen for that film was nowhere near what we get on network TV these days. While AR-15s were familiar to anyone that spent as much time as I did at gun shows, I didn’t have a Kalashnikov in my meager collection. 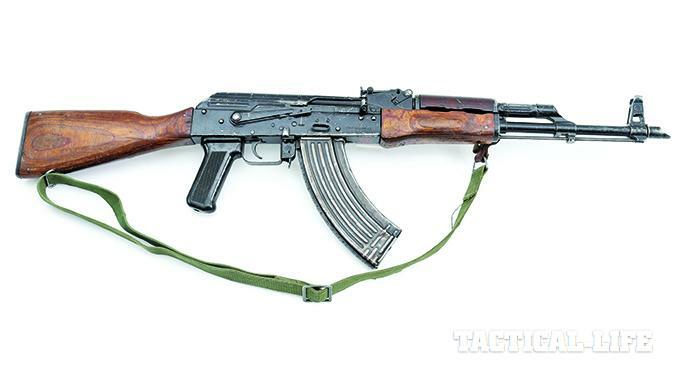 I knew that any AKs in the U.S. were rare and somewhat available, but $1,250 for the new Steyr Maadi advertised in Soldier of Fortune magazine was more than I could hope to swing. The closest I would get then to quick-firing any Soviet shoulder arm would be sending 7.62x39mm ammo downrange in a Vietnam War trophy SKS. 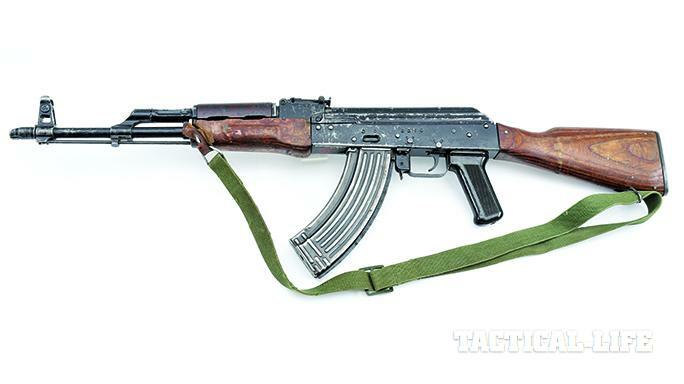 My first AK was to be a Valmet M78 .308 rifle, purchased not long after I finished school. 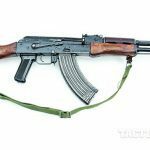 But I never forgot the AKs I had seen in “Red Dawn.” I wore out two VHS copies of the film from constant playing over the years. Flash-forward a decade to 1994. I was working for the National Rifle Association as curator for the National Firearms Museum, and I had just moved out of Washington, D.C., to northern Virginia. We had brought a major collection of guns out of California that formed the foundation for the planned museum’s timeline, and during the transit, I was able to visit Stembridge Gun Rentals. We later borrowed items for museum travelling exhibits, including a Colt Single Action Army (SAA) that had been wielded by James Arness in Gunsmoke. But it was in 1998 that I learned that Stembridge was liquidating part of its collection of movie prop guns, including the arms used in “Red Dawn.” All of these guns had to be transferred outside of California for legal sale due to California’s restrictions. Now that I had a steady income (and an understanding wife), I quickly contacted Long Mountain Outfitters and bought one of the Maadi AKs. How fast was I on the acquisition trigger? 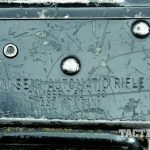 If you looked at the Long Mountain Outfitters website, the serial for my rifle—S000350—was the first semi-automatic rifle shown on its list. 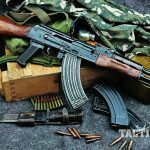 A total of 32 semi-automatic Steyr Maadi AKMs were converted and registered by Pearl Manufacturing for select-fire operation, and another 21 AKMs were left in their semi-auto configuration. Two Valmet Model 78 rifles were also converted for the movie. 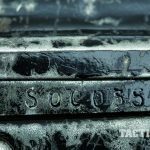 Each of these 50-plus Steyr Maadi prop rifles was “roughed up” to mimic years of service, and, based on the scars and scratches on my example, it was far more than just tossing the gun down a driveway a few times to get that rugged “battlefield” patina. These guns had a rugged character that had an appeal for me far beyond the more usual excellent-condition collector prizes I dealt with in the museum world. In all honesty, I think the price tag I paid for this “Red Dawn” gun was just about what these rifles had originally cost when they entered the American marketplace 16 years before. When I opened the container (shipped to my local FFL), I found a very well-worn gun that, on the outside, looked as if it had been through a lot. The bore and internals, however, were immaculate. 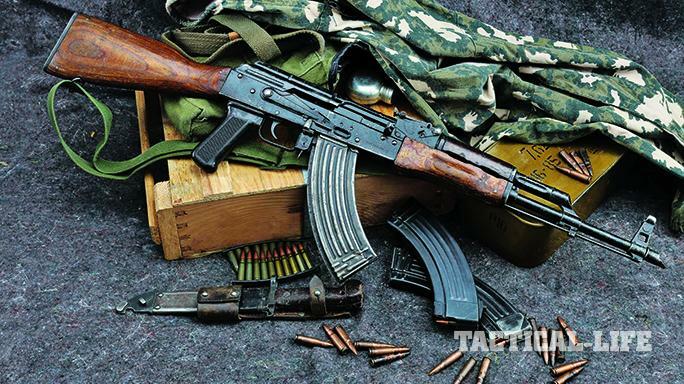 While sold with a sling, the rifle did not come with a magazine, but it took a quick trip to another gun show to acquire a beat-up magazine that matched. A blank-firing adapter that fit under the muzzle brake was also included, and I think my first act was to remove it so I could fire the rifle with live ammunition. This adapter resides somewhere in a box, mixed in with the miscellaneous arms-related bits and pieces that go along with any collection. As a collecting curator, I wanted to share what I had with the NRA Museum’s “Real Guns of Reel Heroes” exhibit in 2002. The Maadi rifle went inside an exhibit case for thousands to enjoy as they passed through the galleries. First, in writing up the display and catalog text for the rifle, I had to research exactly how this piece had come to be. In the 1960s, Russian aid to Egypt included a turnkey factory to manufacture AKMs. After supplying the Egyptian military’s needs, the idling factory staff pondered how to stay in operation. 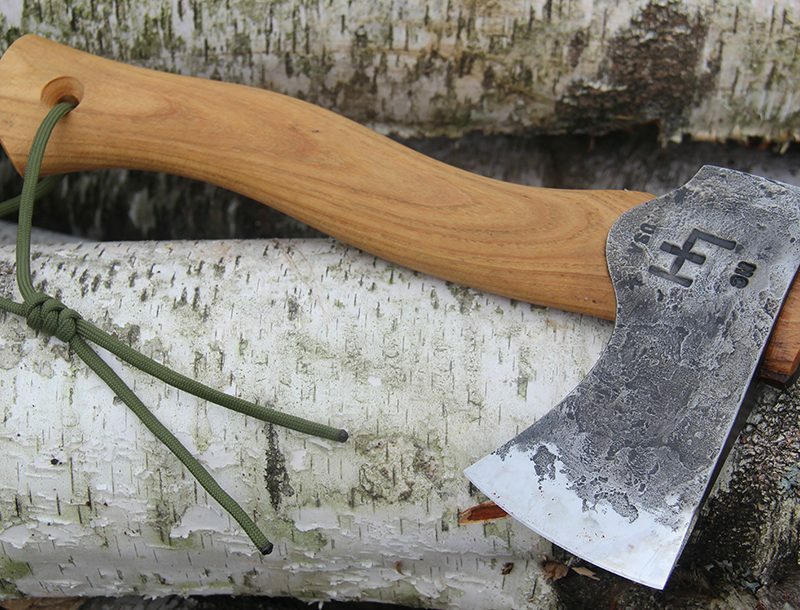 During this time, the military market was well saturated with Russian deliveries of Kalashnikovs. 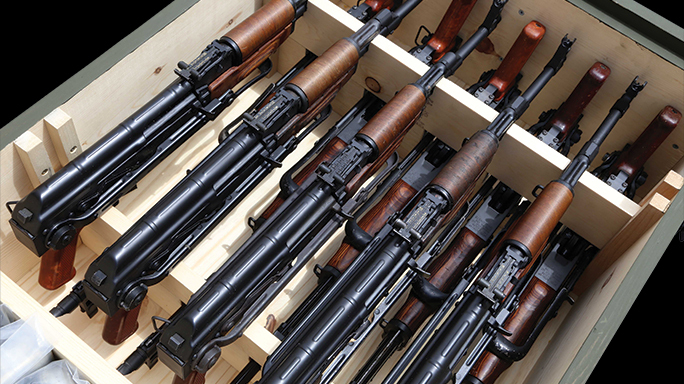 Transferring select-fire rifles to the civilian or law enforcement markets required extensive paperwork. 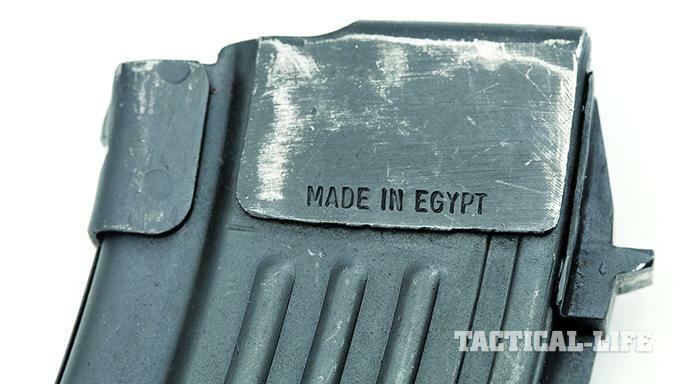 But then the light came on in Cairo—why not just manufacture and market semi-automatic rifles? This would involve much less paperwork, and 922r import criteria did not arrive until decades later. 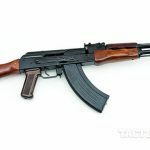 The first American shipments arrived in 1982 through Steyr-Daimler-Puch, a company that already was importing rifles into Secaucus, New Jersey. But there was a problem. Despite being built as semi-autos, the first 1,000 or so of the Steyr Maadi AKMs were shipped with full-auto bolt carriers inside. Much like the early G-series FN FALs, the error was exempted by the Bureau of Alcohol, Tobacco, Firearms and Explosives (BATFE) at the time, and laterproduction rifles came with modified bolt carrier groups. 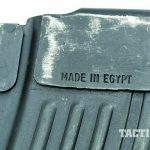 The new Maadi firearms had 30-round magazines that were easily distinguished from any rifles brought back by GIs from southeast Asia, with each bearing a “Made in Egypt” stamping on the magazine’s upper face. 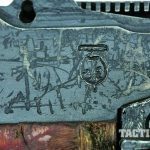 Identified as having been made at “Factory 54” on the receiver and incorporating an Egyptian pharaoh’s helm as a logo, these rifles were the closest copy of Russian stamped-receiver AKMs that could be had at that time. 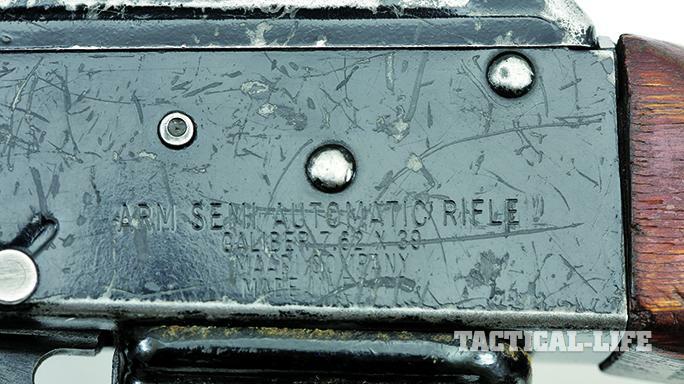 Laminated wood furniture and a glossy black metal finish were all part of the original package, plus each rifle came with a sling and three magazines. The formal Maadi rifle model designation was ARM. But back to the exhibit text. 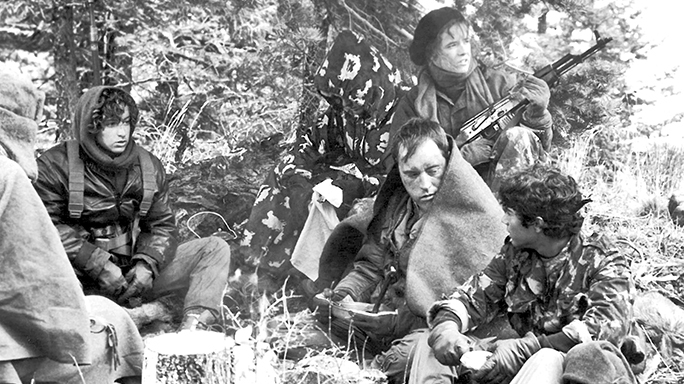 To get more detail on how the role of the AK was played out in “Red Dawn” required watching the film again and again. Most who have seen the film remember that the original firearms used by the high school crew who escaped into the hills above “Calumet, Colorado,” (actually Las Vegas, New Mexico) were a mixed assortment of sporting rifles and shotguns and bows. The ivory-gripped Colt SAA carried by Patrick Swayze in the film was even a family handgun provided by screenwriter John Milius. It was only after the teens had encountered a small group of Soviet soldiers that they were able to acquire their AKs. 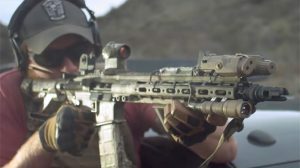 There is a small part in the film that passes quickly on the screen where “Robert” (C. Thomas Howell) is carving notches into the stock of his rifle. Two rifles with carved stock notches were part of the group sold through Long Mountain Outfitters. 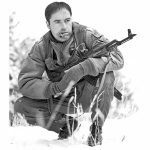 For any film, there is the primary rifle and a backup gun or two held in reserve by the prop master in the event that the primary needs to be quickly replaced to minimize costly downtime during filming. 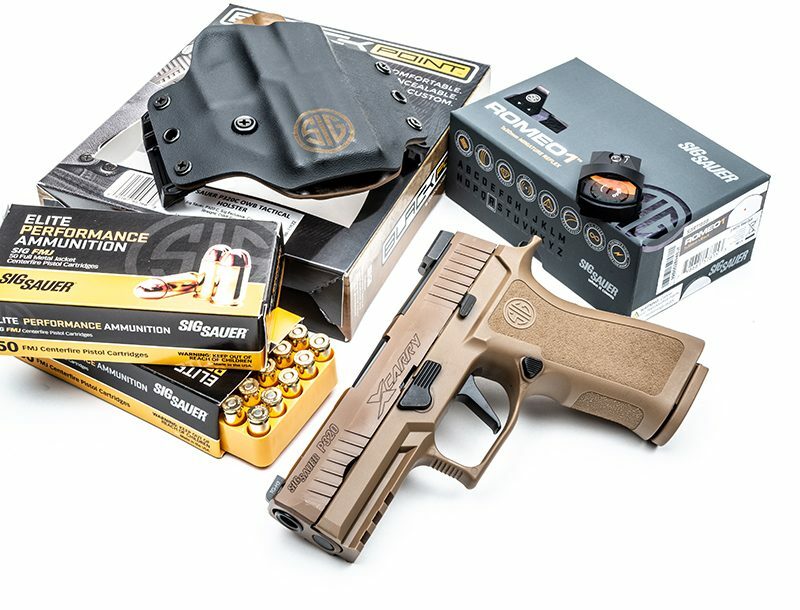 Bear in mind that most prop firearms are not used in just one film and then put away—a prop company makes its money by keeping its stock in use. 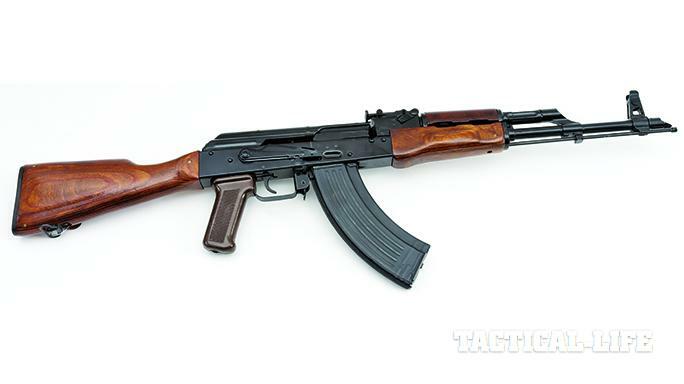 The “Red Dawn” AKs were supposedly also used in the Rambo series of films and other productions over the years. Thinking about this Steyr Maadi AK and the more than 30 years it has been in existence can make one wonder­—who in the cast could have held this gun in the film? With the same firearm needed for both antagonists and protagonists, this rifle might have been in a Russian hands one day and Charlie Sheen’s the next. I’ve looked over the studio stills from this film for hours intently, attempting to see if I could actually tie this rifle to an actor or actress that could have held it and used it on film. In the end, I couldn’t. But I have no doubt that this rifle was there on the set when, high up on a ridgeline, “Wolverines!” shouted out over a landscape. It’s just that kind of gun. 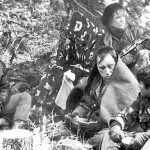 This article was originally published in ‘AK-47 & Soviet Weapons’ 2017. For information on how to subscribe, visit outdoorgroupstore.com.